Studying health will provide you with the knowledge that you need to be involved with many aspects of the healthcare world. 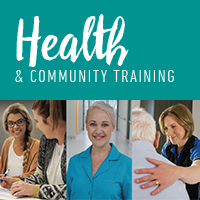 You can assist with allied health programs, know how to comply with infection control policies and procedures, assist with client movement, interpret and apply medical terminology, and recognise healthy body systems in a health care context. You will learn to understand and maintain a high standard of client service, and you can tailor your studies to address specific workplace requirements that affect you. Bendigo TAFE nursing students also have access to the Bendigo TAFE clinical training facility which is a joint initiative between Bendigo Health and Bendigo TAFE. The Australian Health Practitioner Regulation Agency (AHPRA) is the organisation responsible for the registration and accreditation of health professions across Australia.